Just because a guy is a rap star doesn’t mean he doesn’t get down with the people that really get down! This Hostile Takeover 2012 Tour footage edited by Johnny Theophilus demonstrates just how crazy these shows can be with clips from each one of the Strange artists and a short interview with Machine Gun Kelly. Even halfway through the tour, they bring nothing short of greatness to the stage. Check the 2:35 mark for an idea of how nuts the fans are. 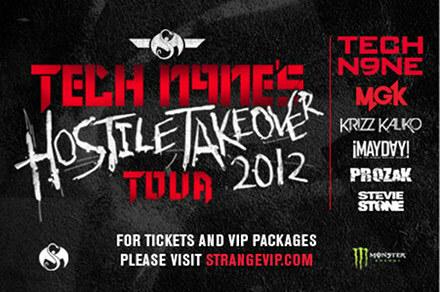 Click here to cop your tickets for Hostile Takeover 2012! Do you have your tickets to Hostile Takeover 2012?